ZOOM LENSES – Many zoom lenses commonly sold with good cameras can only resolve 6 to 9 perceptual megapixels of the camera’s 24 MP sensor! Something not highlighted in mainstream reviews. The point and shoot (p/s) camera is being squeezed into the grave from two sides. 1) on the inexpensive side by constantly improving smartphone cameras. And 2) on the more expensive side by very light mirrorless, interchangeable-lens cameras. If photography is a serious objective of your trip, their near “pro-level” performance justifies their cost/weight vs. carrying just your smartphone. And I will cover smartphone cameras, accessories, and techniques in a future post. Camera Shake can quickly blur a 24 megapixel image down to essentially zero megapixels! A Good viewfinder allows for faster photo taking, better photos, and fewer re-takes. That is, the better you see your image and the more information you have before you take your photo, the better the photo. Sharp as I use it is the “perceptual megapixels” of the final image. This is a combination of both lens and camera—not simply the native resolution of the camera sensor! As an example, for most 24 MP, APS-C (crop sensor cameras like the Sony a6300 and a6500, Nikon D7200 or Canon EOS 80D) the perceptual megapixel resolution final image maxes out at around 17 MP or around 70% of the native 24 MP sensor resolution, even with the best and most expensive prime lenses. Almost all of the loss of the camera sensor’s 24 megapixels is due to the lens. Compared to primes, most zoom lenses do worse, with image resolutions well below 50% of the camera’s sensor. Some going as low as 25% or only 6 MP of your camera’s 24 MP sensor. So it’s important to consider the camera lens combination with a major focus on the lens image quality. One could even argue to select your lens first, and get a camera body that works it. For more reading see DxOMark on Perceptual Megapixels, and take a look at a sample table of the Perceptual Megapixels for Nikon DX lenses on various camera bodies. The lens for this is probably the Rokinon 12mm F2.0 NCS CS Ultra Wide Angle Fixed Lens available in Sony-E and u4/3 mount. Excellent value, fast and reasonably sharp. Manual focus tho, not that it is a big deal when doing astro work, just set it to infinity and go. “Point and shoot like,” 1-inch-type sensor cameras, e.g. the Sony RX-100 series do perform significantly better than the best smartphone cameras. For some their smaller size and lower weight vs. a mirrorless camera is a godsend. 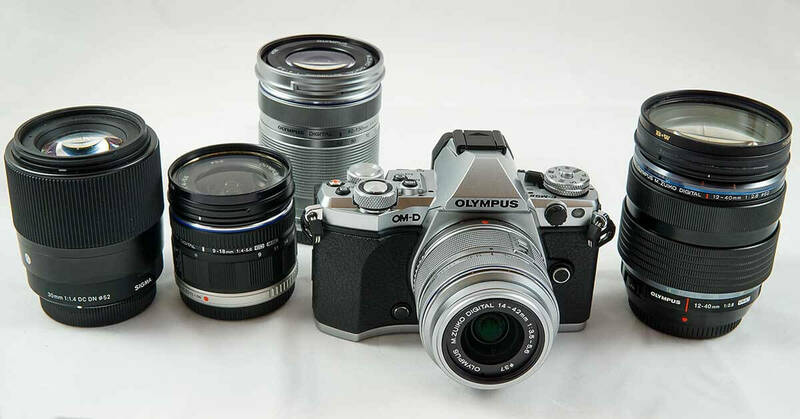 As such, they occupy a valid but narrow niche between smartphone cameras and mirrorless cameras. But note that their image quality not quite as good as similarly priced mirrorless cameras that may weigh only a few ounces more. They are too large and heavy to be truly “pocketable.” And finally, their single lens is only about 1/3 as sharp as the best interchangeable camera lenses for mirrorless cameras like the Sigma 30mm f/1.4 Contemporary lens. For me, its all about the speed and ease of taking a photo. Since I changed to using the Peak Designs CapturePRO mounting system on the shoulder strap of my pack, I get 2 to 3 x more photos per trip. More than I ever got with a point and shoot camera in my pocket! Note in the video how quickly easily I put my pack on with the camera already attached to my shoulder strap. No camera spinning around and twisting up the shoulder strap. I’d like to ask a potentially stupid question: When backpacking with your a6000 attached to your Capture Pro, how do you protect the camera if it starts raining / gets dusty / bushwhacking / etc, since it isn’t weather-sealed? Do you just shove it in your pack, or do you use some kind of cover and keep it on your backpack strap? Good Q Lange. For rain, I wear a large brimmed hat, and that with slightly leaning over when hiking with a backpack on gives the camera enough of a rain shadow — especially as it rides so high on my shoulder. That helps a lot with intermittent light rain and mist. A lens hood is essential to keep water off of the front element, even with weather resistant lenses. Finally I have been know to carry it in my hand for a while with a plastic bag or stuff sack wrapped around if if i really need the shots. But as some point if it rains hard enough it goes into a w/p bag between shots (either in a side pocket where my partner can get it quickly, or into the main pocket of my pack if it’s pouring down). If it’s raining this hard, it’s really not good photo weather anyway. The light way I protect my camera: I put the camera in a homemade bubble wrap bag (bubble wrap and packing tape), and then put that in a gallon freezer ziploc if I am afraid of serious precip (see pic). And yes if conditions get really bad I packing the camera towards the top of my pack in a way that keeps it mostly compressed from all sides with other gear. Many thanks Alan, good advice as usual. I’m walking the JMT in July this year – the weather may be decent (the usual Sierra summer weather) but I’m anticipating the route still being in the guts of melt off and generally wet conditions. I will also be wearing more of a “French Foreign Legion” hat (baseball cap with a mullet), which probably won’t provide much shelter for my a6000 during light rain. I was considering using a light waterproof stuff sack (something like the Zpacks “small” cuben fiber stuff sack) that could just be pulled over the camera and cinched up for light to moderate rain protection. As long as it fits over the camera while attached to the capture pro, seems like it would be a quick, easy on-easy off solution. Will report back! Nice Lange. I don’t think you’ll regret the purchase of lens! And good tip about the fit of the ZP stuff sack over the camera. What size? Some people take pictures when they hike, and some people hike to find photographs. Being in the latter camp, I carry one of two Canon 5DsR DSLRs 50MP full size sensor, never more than two lenses, and usually one. One 5DsR is as produced by Canon and the other DsR has been converted to infrared with a 720nm wave band. I find that carrying many lenses causes too much playing with the equipment and not enough looking for the photograph. I tend not to use zoom lenses for the same reason, not because they aren’t sharp (my canon 100-400mm f4L II lens is the sharpest I own), but because one lense forces me to hunt for the photograph. By spending my time looking for them, instead of switching lenses and twisting rings, I have a much better chance of finding them. Do I miss a few that I would have taken with a bag full of equipment? Perhaps, but I would have missed many more that I have taken if I did not spend my time looking. All of my lenses were extensively tested at f11 for two reasons. First all lenses aren’t created equal and you may go through several Canon 50mm f4 lenses until you find one that is sufficiently sharp. Second, the sweet spot of focus on any lens is approximately two stops from wide open. And everything I shoot is at f11. Stopped down any further and sharpness falls appreciably and any larger aperture does not provide enough depth of field. Selective focus rarely works in a landscape. So why buy a expensive fast lens? So you can do natural light at a wedding of course. So we test all of the lenses at f11. The results are often surprising. We tested both Zeiss 20mm range lenses ($5000 and $3000 respectively) against a Canon 20mm, a 20mm Sigma ART lens and the Tamron 20mm. The $400 Canon beat the field. I got rid of my 24-70mm Canon L lens because the Tamron was sharper. We have rented, bought and sold a lot of lenses. The current carry is the 35mm Canon f4L Series II. Sharp as a razor clear into the corners,, heavy as hell, expensive and a wonderful length for a full size sensor camera. My tendency is toward wide angle. Which is another point, for hand holding, wide angle is much less susceptible to camera movement blur. I often do carry a tripod. An Induro baby grand. It is small, carbon fiber and looks like a table top tripod on mega steroids. I don’t use a ball head on it, I just lengthen or shorten the legs. I use L brackets to change from horizontal to vertical. I use the old style Leki trekking poles that have a tripod mount on the top, again without a ballhead. I have some wonderful Gitzo ballheads, I just think it is bizarre to carry them. Usually adjustments are a few degrees. A ballhead is overkill. I hand hold a lot.. When I hand hold, I usually take 4 or 5 exposures of the scene in succession,, so one of them is bound to be sharp. I am not suggesting anyone follow my lead. It makes photography expensive, sometimes boring and generally a lot of work. Photography should be fun or an obsession. Thank you for all of the advise! I currently have the a6000 with the Sony 18-55 3.5-5.6 (need to upgrade) and the Rokinon 12mm which I love for shooting northern lights. I’m going to be doing a 1,000 mile backpacking trip across Alaska next summer, so I’m trying to figure out what upgrades to make so that I can get excellent photos (I would like to be able to blow them up) and obviously not blow my overall efforts toward being ultralight. I know that experience matters more than the equipment with photography, and I’m working on that part. My question about the Sigma 30mm f/1.4 – is this still a viable/good lens to use if I’m going to be largely shooting without a tripod, and neither the lens or camera have IS? Or would an upgrade to the a6500 be necessary for making full use of this? I’m also intrigued by the Sony 18-105 with OSS that you talk about. Do you feel that this could be used as a single-lens quiver? Thanks again! I’d love to talk via e-mail if you have time. Thank you for all the great information! I’m switching to ultra light equipment and I’ve found your website super helpful. I have a Sony a6000. What do you do when it’s raining/spitting rain with the shoulder strap mount? Very useful information. I believe there is a big distinction that needs to be addressed. What are the pictures going to be used for? I make my living selling prints and most of it is back country. When I would shoot just for my own collection or just to prove I made the long trips I would just bring a small, compact unit. But when I sell some prints that can be 50 X 60 inch I have to bring all my firepower. I usually save weight by other means. I just starting bringing a hammock instead of a tent and going with just a survival blanket instead of a sleeping bag. My last trip into Yellowstone I carried 17 pounds of camera gear for a three day hike. Including two bodies and two lenses (both Cannon 5Ds). I never travel without a very sturdy tripod being a lot of my work is with waterfalls and a 3-5 second exposure is impossible handheld. I’ve made the mistake of not bringing something on a trip and having to make the trip all over again. Something as small as an ND filter can ruin 30+ mile hike if the only goal was to get one picture. Have you used that ballhead? Can it hold the camera in a vertical position without slipping? I typically shoot my D810 with a L-bracket on a Kirk BH-1 ballhead, but the L-brackets are heavy and with the Fuji I use for hiking the L-bracket gets in the way of the shutter release cord. To shoot vertical with the Fuji, I’ve been flipping my camera to a vertical position on the ballhead. I’m surprised that you tend to shoot only horizontal shots. I write for magazines, sell prints and publish articles on several of my online websites and use vertical shots for all of those uses. Thanks for the feedback on the ballhead. I think I’ll skip it. Great content… I agree with all of it and have been traveling with and shooting with a Olympus OMD EM1 with the 12-40 and 9-18 lenses. The kit is super light and I can carry it for hours and hours and always come home with great images. As for carrying the camera I would recommend the Miggo Aqua X (http://mymiggo.com/product/agua/). This is a stormproof bag that is super east to get into and out of. It hold my EM1 with 12-40 attached perfectly and is the perfect shite weather camera carry system. The EM1 is light enough that I can just put my pack on then throw this over my shoulder and I’m happy. I recently traveled to Iceland on a fastpacking trip (www.juskuz.com/?s=iceland) and this was the perfect way to keep my camera safe and available to capture shots while on the move, even when the weather was total shite. Anyway, great info. I’m super excited about the Sony a6500. But one of the things I really like about the micro 4/3’s cameras is that the small sensor means small/light lenses. The Sony has a larger sensor which should mean better low light performance, but it also means the lenses need to produce a larger image circle and that means slightly larger lenses. It might be worth it, but I’ve been super happy with the EM1 even in pretty challenging light conditions. I owned a Nex-6 with the Sony 16-50mm f/3.5-F5.6. That was by far the very worst lens that I owned that was actually trying to be a good lens. I’ve owned worse “toy” lenses, but the Sony took the cake. The Sony 16-70mm f/4 lens, even though it weighs 10.9 ounces, is a much better way to go. For me, I’m running a Fuji XT-2, 18-55 f/2.8-4 and a 16mm f/1.4 prime when I’m not carrying my full Nikon setup. Or just carrying a RX100m3. Great article. If you’re going to do astrophotography in the backcountry, a fast, ultra-wide prime really helps as well. Great article. Love the peak design mount. I’ll need to grab one for my a6300!